A damn group of teenagers (school group) turned up last night around 8pm and like typical teenagers they were rowdy and noisy but they soon quietened down by 9.30pm ... lucky for them! We woke early and it was sunny by cold and it wasn't long until our feet became wet from walking to and from the sort of camp kitchen so when we set out riding our wet were damp and were very 'chully'!!! and it took a while to warm up. The ride was flat back to Thorton and from there to Taggerty there was a small climb but a great down hill to Taggerty. Taggerty is at the junction with Maroondah highway and we dreaded coming along here but there is no alternative ... but to our surprise it was actually a good ride - there is a wide shoulder and the traffic (being a Monday morning) wasn't that bad, I think it would be different if it was a weekend (especially this coming weekend!). the above photo is of The Cathedral which is in Cathedral state park. The ride to Buxton was lovely, a little rolling but ridable! The traffic is reasonable and there are a few logging trucks and even more around Narbethong. 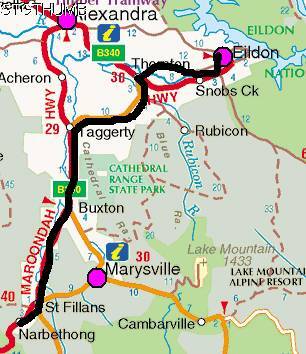 Between Buxton and Narbethong there is no shoulder (for 15km) and the road is undulating but okay to ride. Just before you get to Narbethong you can see evidence of the Black Saturday fires - most houses that got burnt along this road have now been replaced. Even the trees are coming back although they look strange - very straight trunks and heaps of small regrowth on them and even on the ground there is heaps of new Eucalyptus trees growing. The campground is around 4km on from St Fillans and heading up the Black Spur - you get your shoulder back but only for a while then as soon as you see the sign indicating that the next 15km is winding then your shoulder disappears! the campground is a further 300m. It is a quiet campground with no one there - in fact another motorbike couple from NZ turned up and another single tenter. It is not a great campground but good enough for us. It is incredibly expensive for us to stay there (in fact almost a rip off!) for us it is $22 and believe it or not they charge for dogs - Koutas rent was $5 so it costs us $27 for unpowered ... that dog!!! It was a noisy afternoon as there are quite a few logging trucks going up and over the Black Spur and although they ceased overnight they soon started very early in the morning - I heard them around 4am! We spent the evening chatting to the motorbike couple from NZ and boy do they have broad NZ accents - it was fabulous listening to them! our afternoon entertainment was Kouta vs. the chickens! there were a few waundering around the park and they soon came around the tent looking and pecking - this one decided to have a sticky beak at our front door!